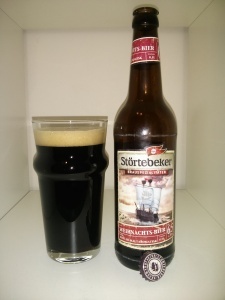 Weihnachts-Beir is German and the brand is Störtebeker Brauspezialitäten. 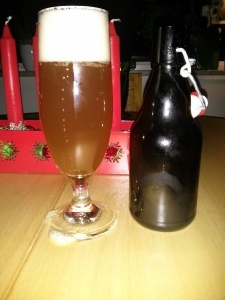 The bottle lists it as a Roasted Malt Aromatic beer but beyond that I can’t actually find a style. It is a dark beer with an offwhite head that doesn’t last, though it isn’t quite as dark as the picture suggests. Despite the description on the bottle the aroma is fairly weak, with hints of chocolate and caramel and not too much else. This beer however is definitely one to be consumed warm. At a recommended 16 degrees I poured it shortly before it reached that mark and it has vastly improved after warming up. The flavour is pretty consistent with the aroma, chocolate and caramel throughout and some malty bitterness to finish it off and a slightly sweet aftertaste that doesn’t linger too long. Rating: 3.5/5 – Pleasant and something I’d definitely drink again, but it doesn’t knock my socks off. Update: Upon looking at Untappd, this beer appears to be a Bock. 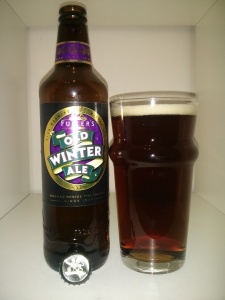 Fullers Old Winter Ale is described on the bottle as a warming winter ale and it can function as that, but would definitely not be my first choice. 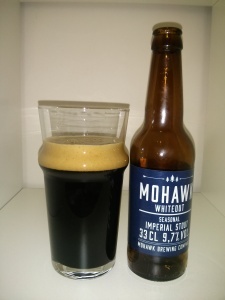 The usual off-white head, though there isn’t much of it and it disappeared quickly, this beer has a solid brown colouring to it and certainly looks good in a glass. The nose is complex and I found myself having having trouble describing it. There was a sharp fruity (pear is what I think of) sweet / sour smell to it accompanied by caramel and liquorice to back it up. The body is just as full of flavour with the sweetness hinted at the forefront but a smooth malty finish and a touch of bitterness in between. I do get some dry chocolaty and earthiness in the malty flavour as well. The mouth feel is very thick, making this a slow sipper. Rating: 3/5 – While interesting and complex with an interesting balance between sweet and smooth, the bitterness at the end doesn’t sit right for me. 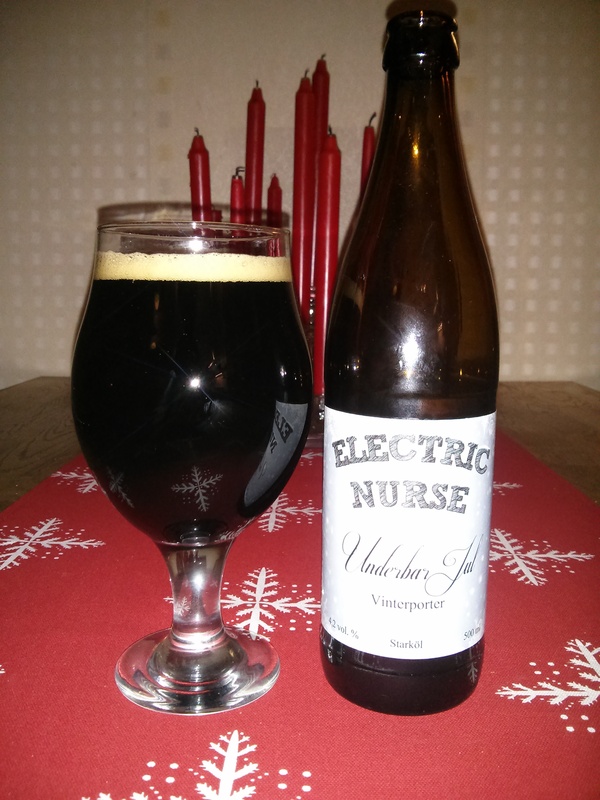 The second Swedish brewery in this advent calendar, Electric Nurse’s winter porter fits the usual description of dark body and light head. The aroma is lightly smoky, which leads into a smoky flavour that doesn’t overwhelm. 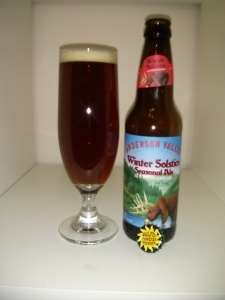 Balanced by a mildly bitter malt base this beer is made to sip slowly in front of a fire. Nothing about this beer is overwhelmingly powerful or in your face. Rating: 4/5 – Well balanced and laid back this is an easy beer to enjoy as a background to whatever else you are doing / eating. A black body and a coffee coloured head (the head is darker than it appears in the picture) this imperial stout by Mohawk (a Swedish nomad brewer) is not what you expect from a drink in this category. The first thing I noticed when pouring this beer was a very powerful grapefruit aroma that I was able to smell from a meter away. The fruity flavour carries through to the taste and the body is much lighter than you would expect. There is also a small amount of hop bitterness as the beer goes down, and it lingers a while. While there is some malt character in the flavour it definitely takes a back seat to the citrus and you have to look for it. Rating: 3.5/5 – I expect fruits and hops in my IPA, not my stout. Tasty but calling it an Imperial Stout is misleading. Mikkeller is the first of the nomad brewers and I was recommended to always pick up and try any new Mikkeller product I find by an expert beer taster. As such when I saw two Mikkeller’s on the winter seasonal shelf I had to add them to the advent calendar. Today’s Mikkeller is called Santa’s Little Helper and is described as “A Belgian ale with spices”. A deep amber colour to it with a solid off-white head that disappeared rapidly, this beer has a nose of of spices and a hint of apple. The beer has a fairly full thick mouthfeel to it and you can definitely tell that it is a high alcohol beer when you sip. The spice flavour goes all through the beer from beginning to end with a bit of sweetness as the beer goes down. Rating: 3.5/5 – A pleasant beer to sip throughout the evening. It won’t blow your mind but at over 9% it will keep you very warm in the winter time. 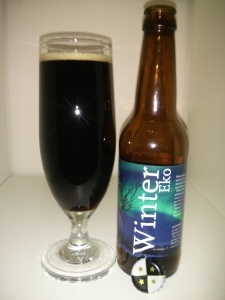 Winter Eko comes from the Slottskallans Bryggeri (Swedish for Brewery) and is an organic black lager, which is an interesting take on a winter beer. The aroma has strong orange notes to it and a solid roasted coffee smell to back that up. The head was a light brown but disappeared quickly and the body is a deep brown colour with hints of red to it, look at it from the right angle and it looks black. The taste of the beer starts with the smoothness that you expect from a lager but is quickly dominated by the coffee that I got so strongly in the aroma. Once it goes down the bitterness of the coffee flavour lingers in the back of the throat. Rating: 3/5 – Interesting take on a lager, coffee flavour is is overpowering. Welcome to my 2014 beer advent calendar. I started this last year when I posted directly to Facebook and tried to add a bit of background behind the beer or my beer experiences. This year I’ll be reviewing the beer itself and doing so on here where everyone can see. 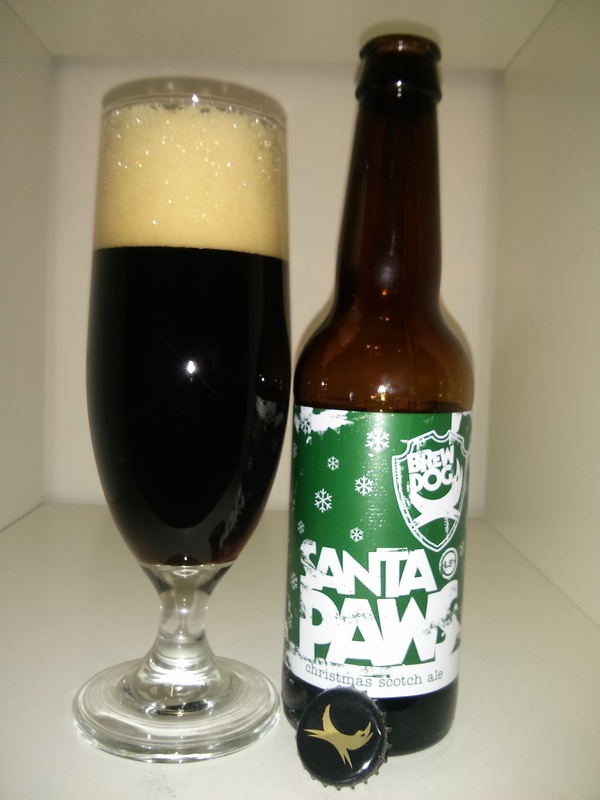 Day one is a Santa Paws Christmas Scotch Ale by Brewdog. 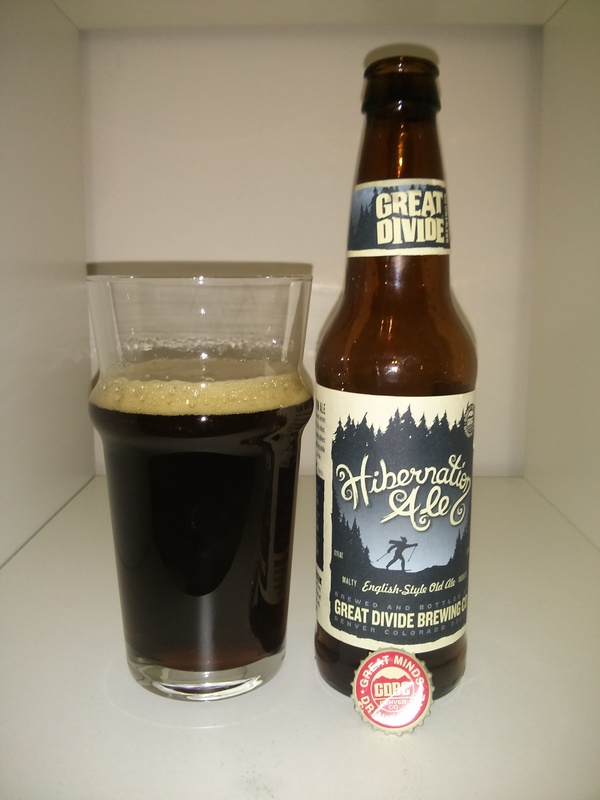 A dark brown ale that looks almost black with a creamy off-white head this beer has excellent head retention. The aroma is of scotch and little else, but the beer has a solid malt backbone and hints of coriander to it with a slightly tart bitter finish to it. 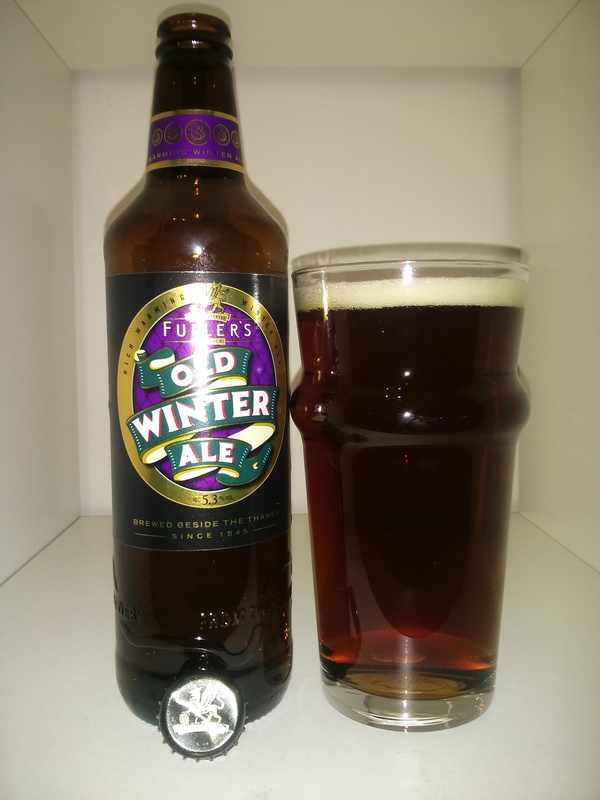 At only 4.5% it isn’t much of a winter warmer, but does make an enjoyable sipping beer. Rating: 3.5/5 – A solid scotch ale without too much going on. Enjoyable but there are other Brewdog beers I’d recommend before this one.